This Recipe for Grilled Apple Slices with Glaze makes the perfect side dish for pork, chicken, steak and salmon. Grilled fruit is a nice alternative, or addition, to grilled veggies when grilling dinner. Grilling Apple Slices on the Barbeque! These apple rings are scrumptious hot, right of the grill, or after they have been allowed to cool to room temperature. Once the glaze recipe has been made, it takes only about 10 minutes to complete the grilling of the apples. This glaze recipe makes about 1 cup of glaze, but you will not need it if you are only grilling two apples. The left-over glaze can be stored in a sealed container and refrigerated for up to several weeks. This glaze is also great tasting on top of pancakes, waffles, French toast or ice cream. Or, use it as a glaze for prepared chicken, turkey or pork. In a small pan, over low heat, combine the maple syrup, apple cider and the brown sugar, and stir until the sugar has completely dissolved. Add the cinnamon stick, star anise and cloves to the pan. Bring to a simmer, and cook mixture until it has been reduced by about one-quarter. Stir in 1 tsp. soy sauce (optional). Allow mixture to cool to room temperature, and then remove the spices. Heat the barbeque to medium-low heat. Brush both sides of the apple slices with vegetable oil, or spray both sides with oil. I like to use a natural oil, or olive oil in my re-fillable spray container. These are available for purchase in some Stores, or you can purchase it online from *Amazon.com. Place the apple rings on the barbeque grates and cook, covered, for about 2 minutes per side, or until deep grill marks show on both sides. 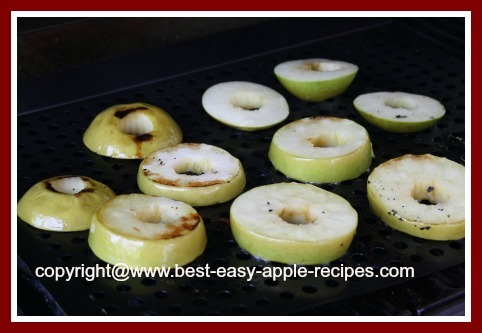 Brush the tops of the apple slice rings with the glaze, then grill for another 2 minutes. Turn the apple slices over, brush with the glaze, and grill another 2 minutes. Serve as a side for pork, chicken, flank steak and salmon. Note - this recipe has been adapted from a recipe included in a newspaper that I receive, The Hamilton Spectator.